THE REVIEW: There’s a lot to say about this film, which I guess is appropriate for a film that is all about communication with an alien species. Not everything is as it seems, and as is often the case, if you actually take the effort to listen and are actually willing to accept competing ideas, something amazing might happen. Like director Denis Villeneuve did with Sicario, Arrival is masterfully crafted with suspense. It is like constructing a 1000+ piece jigsaw puzzle: hard to do, and at many times you are unsure how things are going to proceed. At no point does this film seem slow or lose your attention. Even at the beginning, as you are introduced to the characters and the premise, there’s an unmistakable sense of purpose. You see lots of things, mostly small passing details. But as the film proceeds, these minor things add up to create a gripping tale. I mention the very beginning because nothing particularly interesting happens but yet you still feel as if you’re at the edge of your seat, waiting almost for something to happen. This is an all-around great film not just on a broad level (fantastic ensemble cast, original premise, cinematography, editing — the list goes on) but at the detail level as well. A great example of this is the cut scenes that are sprinkled throughout the film. These cut scenes are of Louise Banks’ (Amy Adams) life back home with her daughter and are incredibly well done. Often (à la The Revenant) these don’t actually add anything to a movie because they don’t often lead to anything and could easily be done without. 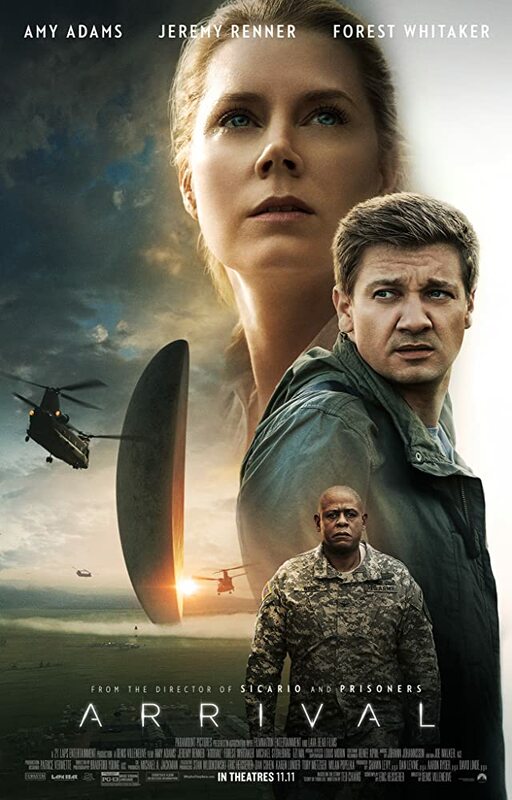 With Arrival however, they are still interspersed and sporadic enough where it’s not a large part of the film (e.g. Jason Bourne’s flashbacks in the Bourne trilogy), but they lead to a whole other meaning by the end. Piece by piece they grow with clarity and help reveal key pieces of the film. By the end they become a central part of what makes Arrival great. How they are integrated into the story adds to the suspense and invites multiple viewings after the fact. There’s sure to be something new to learn on subsequent viewings and unlike most “gimmicks” (à la a film like Memento or Interstellar — or for that matter, pretty much any Christopher Nolan film), knowing where the film ends up won’t spoil or diminish the value of a rewatch. There really isn’t a thing I can think about that I don’t like about this film. Start to finish I was engaged and thrilled watching the story of Arrival unfold before me. Villeneuve has a talent for keeping suspense and keeping you guessing about what is coming next. As of now, Arrival is my favorite of the Best Picture nominees, although I still have plenty more to watch. And while it may be my favorite, it really has no chance of winning because, ya know, Hollywood-types don’t like awarding the top prize to a sci-fi film. But alas, it doesn’t need to win a golden trophy to still be my favorite.